Content: 68% seabuckthorn and 32% natural apple juice. 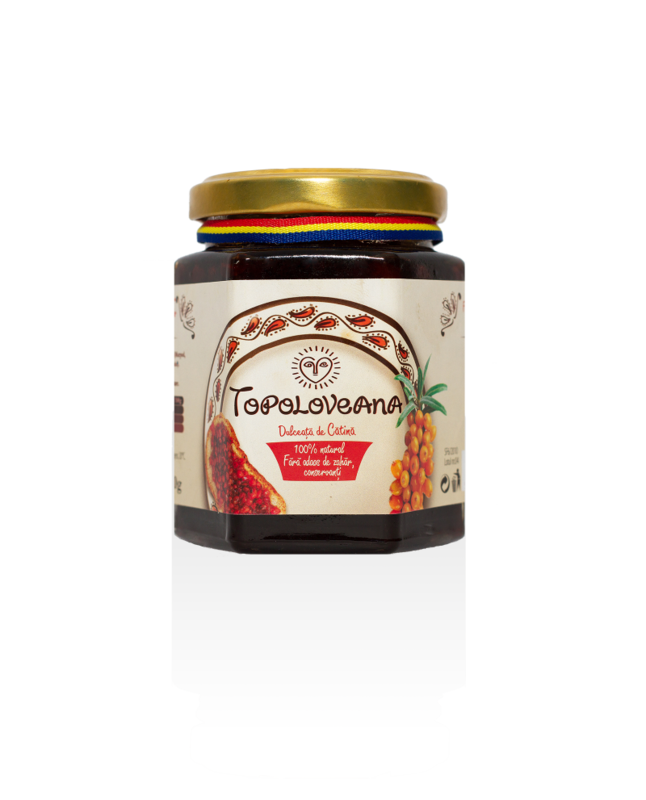 Topoloveni Seabuckthorn Gourmet Confiture – 230 g.
Description: This product keeps the fruits intact, uncut, the fruit seed must be crushed in the teeth because they contain 18-20% oil. Nutritional qualities: The Seabuckthorn Gourmet Confiture has a medium energetic value (303 kcal/100 g) and a content of food fibers of 3,73%. Awards: This product was awarded by International Taste & Quality Institute Brussels with the Superior Taste Award One Star in 2011, it received the “Quality Brand” (from National Centre for Comparative Tests) and the title of Official Supplier of the Romanian Royal House. Benefits: antiscorbutic, anti inflammatory, antimicrobial, tissue regeneration, anticoagulant, antioxidant and antitumoral, ulcer healing, antidepressant, protective and liver regeneration, radiation protection, it represents a tonic because of its high content in minerals and vitamins.